The plumber comes tomorrow morning to fix the sink. To say I'm looking forward to that is a bit of an understatement. No more dishes in the bathroom sink and I can go back to cooking and baking and making all kinds of wonderful smelling messes in my kitchen. But, in the interim, I have to consider what I fix for lunches and suppers so the resulting dishes fit in the bathroom sink. The best course of action, I decided, was to stock up on frozen dinners. Thankfully, they were on sale. Yesterday's breakfast was one of the items I purchased. 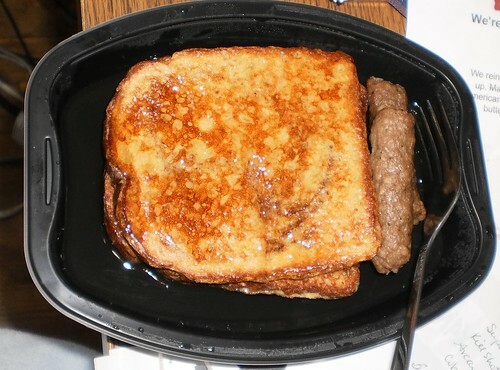 This is a Smart Ones French Toast and Turkey Sausage meal. The sausage was good. The french toast was very hard to cut. They give you a syrup packet but it says "One use only" and advises you to toss it away if you don't use it. That can't be "real" syrup in the packet then, if it's not something that can be stored if you don't use it. I have my own syrup which I used. Lunch today is Lean Cuisine's Orange Sesame Chicken and the last container of yogurt. I can recycle all the package parts and all I have left to wash is the cutlery. If I use the plastic utensils we have in the office, I don't have anything to wash when I get home. These dinners were 5 for $10.00. At $2.00 a piece, that's probably less than what I can make them for at home. Are they a good value? I'm on the fence about that. Easy and convenient yes, but the ingredient list has things I can't pronounce which makes them less than ideal for watching what one consumes. I just have to get through today and the first thing I want to make tomorrow when I get home from work is this corn, potato and bacon chowder recipe I found. I can almost smell it cooking right now.